you might have to get down on your knees. or bend like an origami human. you definitely might need your magnifying glass, but if you look closely enough — say, at the tips of the twigs you’ve hauled into your house, the ones that “force” the vernal tide — you might, just maybe, see the first droplets of spring. the earth is turning. really it is. even on the days we don’t notice. hildegard of bingen, one of the wise women whose words i’ve been deep in all week (simone weil is the other), calls it “viriditas,” the green energy of the divine pulsing through the entire universe, the animating force, the goodness that charges the world with life, beauty, and renewal — literally with “greenness.” you might call it “hope,” pure and certain. the eternal cycles. the rhythms as ancient as time. viriditas. ebb and flow. the turning wheel of the seasons. winter thawing to spring. grey exploding in green. to some it’s little more than sunlight + chlorophyll. to the rest of us, it’s something akin to surround-sound proof that we’re deep in the clutch of heaven on earth. and so blessed to be here. what wisps of hope have you stumbled upon in these grey days of march? my roundup of books for the soul for the tribune is now my one soulful book you might want to read. budget cuts keep chipping away at newspapers, and the latest cuts cut away two of my three soulful reads in my monthly (or so) roundup. here’s the first of the one-book-at-a-time reviews, a fascinating read from mary gordon who takes on a literary critique of the writer-monk of gethsemani, thomas merton. Mary Gordon — novelist, memoirist, professor of English at Barnard College — has long proved herself to be a Catholic voice engaged in deep and nuanced dialogue with the Church. She is fluent in its rhythms, its mysteries, its illuminations — and its darkness. She is a truth-teller, one not afraid to name her church’s sins, nor unwilling to see through its complexities to its radiant core. Merton, author most famously of “The Seven Storey Mountain,” belonged, Gordon writes, to the post-World War I period “when Catholicism was intellectually and aesthetically chic.” He was one of a heady crop of distinguished literary converts, along with G.K. Chesterton, Evelyn Waugh and Graham Greene. While Gordon begins her examination of Merton’s works on a sympathetic note, fully understanding “the conflict between being an artist in solitude and being a human in the world,” further adding that his is “a spiritual test that combines the ascetic and the aesthetic,” she cuts the writer-monk little critical slack. In her scope is a litany that includes Merton’s autobiography, “The Seven Storey Mountain,” his 1941 novel, “My Argument with the Gestapo,” and finally his seven-volume, 2,500-plus-page Journals — “longer than the whole of Proust,” Gordon notes. Studded with excerpts, Gordon’s meticulous probing of literary Merton points the curious reader toward the richest veins — in effect mapping the Merton catalogue, pointing out the places to begin, or, for a reader already well-versed, sharpening the prism through which he’s understood. It’s an intimate literary portrait, stitched through with Merton’s own threads. Ultimately, it’s a prayerful one. And the prayer echoes far beyond its final page. cradled (v.) hold something gently and protectively. that’s the dictionary doing what it does: defining. in the sixteenth century, circa 1500, the etymologists tell us, the noun slipped into its form as a verb, and that’s how i like it best. to be cradled. to cradle. “grounded” didn’t work because it sounded like i’d been sent to the doghouse. “tethered” came close, but only if you pictured a space walker tied to a lifeline, the sort that NASA so solidly builds, a lifeline that allows for floating, drinking in the sights of the heavens. literally. “tethered,” if you pictured a leash, did not work. and then, in that way that sometimes makes you feel there’s an angel plopped on your shoulder, leaning in, whispering words in your ear, suddenly, out of the vapors, “cradled” appeared. and all at once, i felt my shoulders go soft, in that exhale of a way. when you whoosh out your worries and cares, and all’s right with the world, as robert browning once put it (“song from pippa passes”). and so i am — we are all — being cradled. each and every day. breathing or not. we are cradled in great tender arms that hold us. i particularly love the notion from the german Krätze, “basket carried on the back.” breathe that one in for a moment. right in here — the past luscious whirling days — i’ve been feeling a wee bit lightheaded, and my heart’s been pounding so hard i worry, as i so often do, that it just might give up the ghost. so, as if my life depended on it this morning, i pulled myself out from under the sheets. and i tiptoed out to the holy cathedral just outside the kitchen door, the one that vaults to the heavens, the one that this morning was lit by a crescent of moon. looked to me, more than anything, like one big eye winking at me. God’s eye? and all around me, the dawn’s soft cool blanket fluttered, as if on a clothesline. the cardinals, cloaked in scarlet as always, were up and chirping away — it’s fairly hard to beat a cardinal out of bed. the dew glistened. my toes took a bath when i tiptoed across the yard to fill the feeder with seed. i stood there breathing. feeling the arms wrap around me. winking back at the moon. 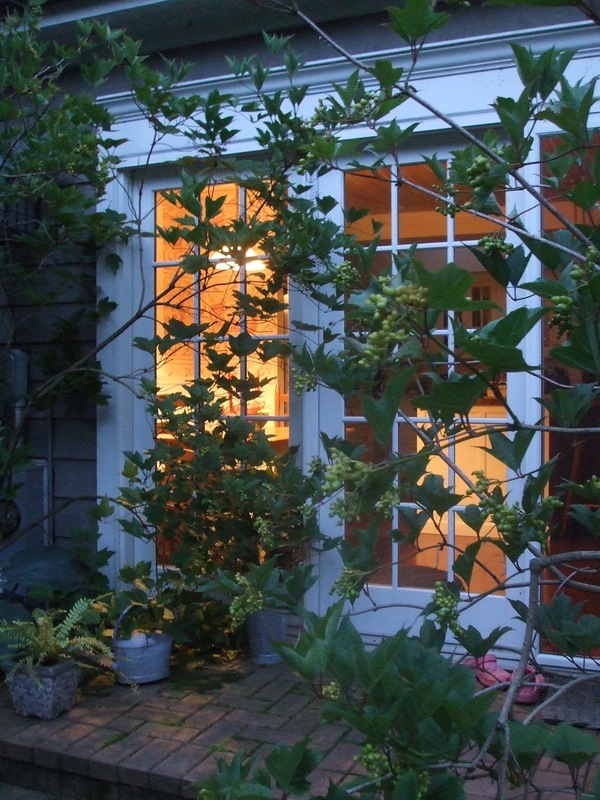 then, i looked to my old shingled house, melted at the buttery light of the kitchen, glowing. sighed a deep sigh of thanks for the house that never fails to keep me safe. i stood there for a short little bit, unfurled my morning vespers, felt the soles of my feet sinking soft into the earth that holds us, always holds us. and then i puttered back toward the kitchen, where a lunch box awaited, and upstairs, a growing boy slept. 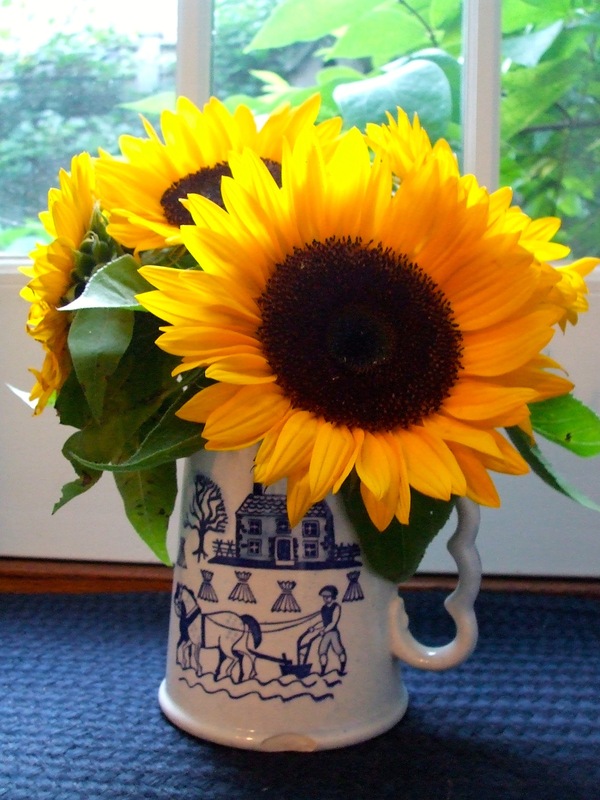 as i poured my first mug of coffee, i stopped to drink in a clutch of sunflowers that peeked from the old chipped milk pitcher. i thought of the blessed beautiful friend who had scooped up those wide-faced wonders from the farmer’s market. and then i climbed the stairs to wake the sleeping boy. i pressed my cheek against his, longer than i usually do. i drank him in, my sweet sleeping child. and, as i’d been doing all morning, i leaned; this time, on him. i leaned on all of these wonders — winking moon, chattering bird, morning’s dew pearled, old blessed friend, and miracle child — and fortified myself for the hours to come. the cradle is there, always there. if we’re willing to climb to the basket strapped to the back — the glorious, heavenly back — that carries us, even on days when we’re dizzy. what cradles you? as in what are the wonders that hold you gently, protectively?